Modern technology has long since found the solution, of course, but in the years leading up to the Second World War housing a fourcylinder engine in a motorcycle frame was quite a problem. Mount it lengthwise, and the machine's wheelbase was almost unmanageably long. Mount it crosswise, and the bike was unacceptably wide. Matchless found one answer by evolving the narrow angle vee-four Silver Hawk, then a London dealer-designer-rider named Edward Turner thought up another; why not arrange the cylinders two by two - a sort of pair of vertical twins, one behind the other? The story goes that he scribbled the bare bones of the idea on the back of a cigarette packet, took the train to Birmingham, and tried to arouse interest in one factory after another. BSA were nearly tempted, then got cold feet. In the end it was Jack Sangster, boss of the Ariel works, who decided to give the scheme a go. He found Edward Turner an office, gave him a junior draughtsman as an assistant (none other than Bert Hopwood, in later years to become a top designer in his own right), and told him to go ahead. 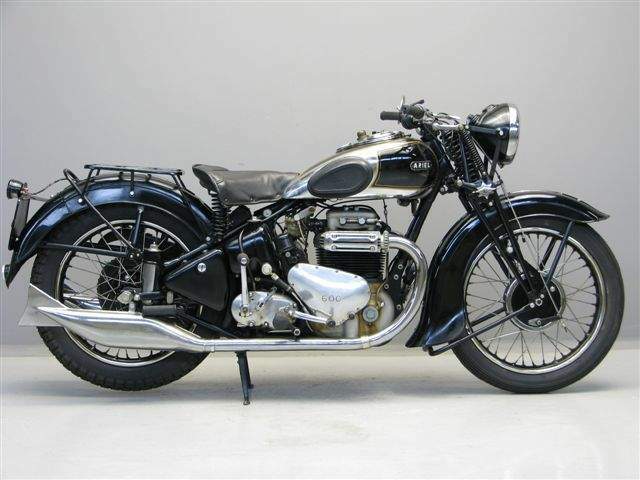 The result was the 500 cc Ariel Square Four which, by a coincidence, made its public debut at the very same Olympia Motor Cycle Show of 1930 as did its arch-rival, the vee-four Matchless. For convenience, the Ariel company mounted the new engine in the same duplex-down-tube frame already in production for their 500 cc sloper single, and a pleasant little job it was, too. 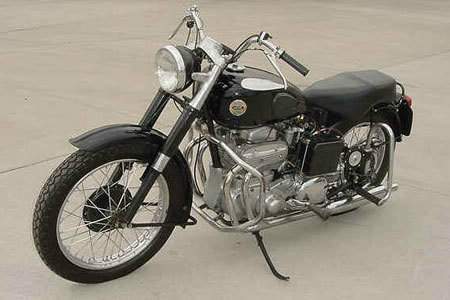 But riders (especially sidecar men) felt that something a bit bigger than 500 cc was needed so, obligingly, the makers upped the capacity to 600 cc while retaining the original layout of two crankshafts geared together in the middle, with the rear crankshaft extended outwards on the left-hand side to carry the primary drive. Drive to the overhead-camshaft mechanism was, as before, by a chain on the right. In 1933 a fair bit of redesigning had been undertaken. Instead of a separate oil tank, there was now a new crankcase assembly incorporating an oil compartment. A single-plunger oil pump driven by an eccentric delivered lubricant to the geared crankshafts, while surplus oil overflowed into troughs into which the big ends dipped. Also new for 1933 was a single-downtube frame with a duplex engine cradle and (at extra cost) a new four-speed Burman gearbox with positive-stop foot change. The combined effect of the redesign work was said to have cut the weight by a hefty 25 lb and the wheelbase by 1.5 in, resulting in a marked improvement in steering and roadholding. Nevertheless, the overhead-camshaft Square Four was not the out-and-out success that the company claimed, the main snag being insufficient air space between the cylinder head and the underside of the cambox assembly. As those who tried to hot-up an Ariel for speed attempts (such as Ben Bickell did at Brooklands) soon found, the cylinder head tended to overheat and warp, and in consequence the engine developed an insatiable appetite for cylinder-head gaskets. They got over that eventually - by redesigning again, this time as a pushrod-ohv engine; but that was later.